One of the things that spring brings to the Mid-Atlantic is wind. Some times things can get a bit crazy in the yard. When the wind is in the twenty or so mile per hour range, the feeders sway a lot. When the wind gusts over thirty miles per hour, the bird feeder baffles start kiting around and the feeders move with them. Birds can deal with a certain amount of movement (they are used to moving tree branches after all), but there is a point when a feeder gets yanked around violently that a bird (or even a person) could get hurt. I have a strategy that I use whenever the winds pick up that works quite well in my yard. 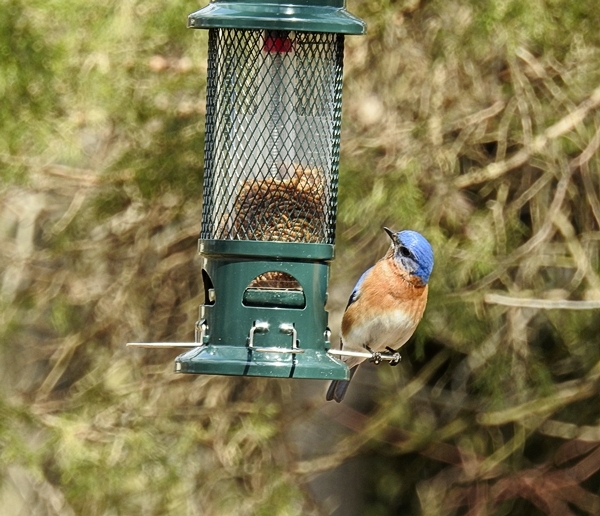 I described it in this post: Bird Feeder Baffles in the Wind. But I am now also using a very small feeder for mealworms and I realized that for this particular feeder, I needed to use a different strategy. I’ve been using a small Squirrel Buster Standard feeder for a couple of weeks. It is currently hanging from a tree branch under an extra large Erva baffle. Technically I could skip the baffle as it is designed to be squirrel proof, but I like the Erva baffles as a second line of defense to keep the squirrels off it completely and because it also provides a little protection from rain. But I could just remove the baffle during windy periods. That would reduce a lot of the movement. And I do this sometimes for various feeders in the yard. But I’m using this particular feeder to offer dried mealworms which weigh almost nothing, so I felt it could still get knocked around in the wind even without the baffle to push it. To prevent that, I added weight. The easiest way to do that with this particular tube feeder is to put the food in the feeder and then add weight on top of it inside the tube. I looked around the house and came up with small weight bars that are designed to slide into wrist or ankle weight bands. 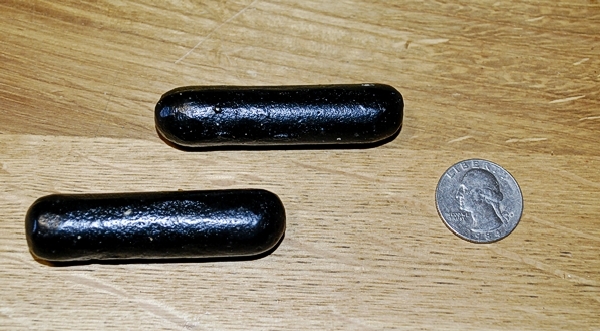 Each weight is a little over three ounces. 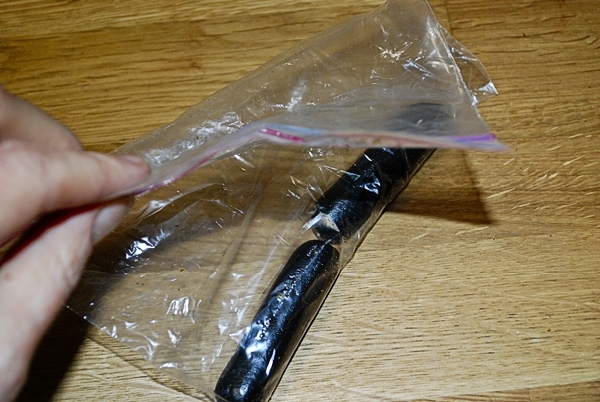 Because I’m not sure what the weights are made of, I didn’t want them in direct contact with the food, so I put two weights in a food safe zip-top sandwich bag, wrapping the bag several times around the weights and then securing it with a rubber band. 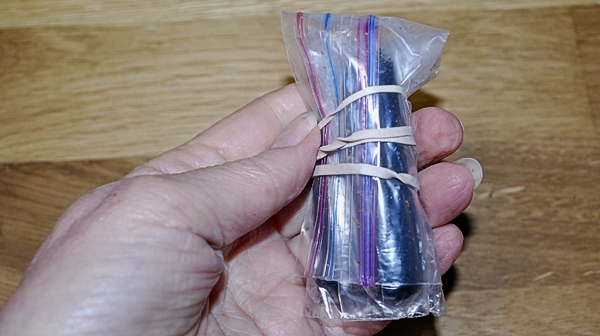 I made three of these double-weight packages, one for each of the feeder tube’s three sections. 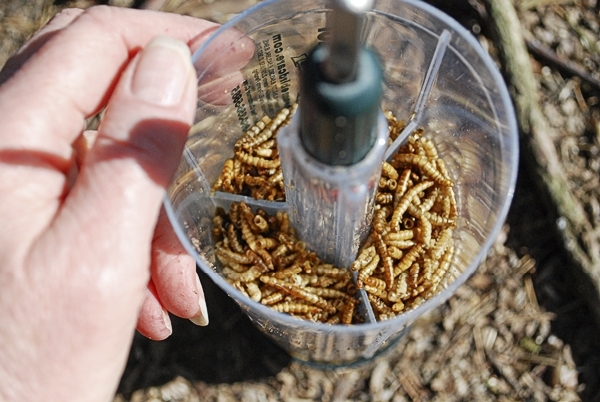 I then filled the feeder half full of dried mealworms and topped it off with the weights. It seemed to work very well, even with the baffle still on the feeder. Even in wind gusts up to 30 or more miles per hour, the feeder quivered a bit when the wind pushed the baffle, but it stayed put. As soon as the weather reports told me that the winds were done, I took the weights out and we are back to business as usual. Problem solved.